You get your morning coffee or tea, toast up your croissant, and settle down in your comfy chair to begin your morning routine of surfing the internet for cat videos. You find this great site with all these links and you realize you can kill a perfectly good hour just watching and reading to your heart’s content. Hooray! You click on the first link – broken. OK, it happens, no big deal. You click on the next one, it works, yay! You watch, you laugh, you cry, you have a great time. You go back to the list, you click on the next one… broken! You start to get annoyed. You are placated by a funny cat video but then there are a few more broken ones. You get more annoyed. Then, you knock over your coffee because you’re annoyed and the next thing you know your computer has gone out the window. 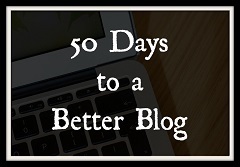 Don’t be the reason your reader throws their computer out the window. Fix your broken links. Fortunately, it’s really easy and there are two ways to do it. Well, first way is super easy and what I recommend. The second way is still easy just a little slower, but it’s a very useful tool I want to introduce you to. 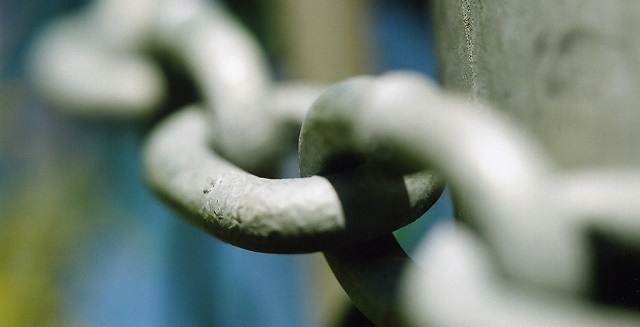 In all seriousness, broken links create a bad user experience for your readers. It’s hard getting someone to your site for the very first time, you might as well work really hard to make sure they have a good time when they’re there so they come back, tell their friends, bookmark it, subscribe, etc… and fixing broken links is almost trivial with these tools. 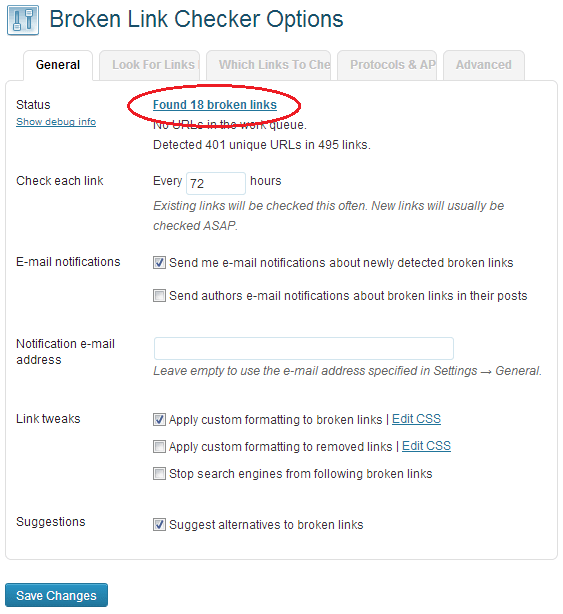 The absolute simplest way to check for broken links is to use this Broken Link Checker plugin. You can search for “Broken Link Checker” through WordPress and it’s the first one listed (created by Janis Elsts). It’ll check for broken links (including images) as often as you’d like, though I find that the default of 72 hours is a little aggressive. It checks new links immediately, like if it’s used in a comment. You can have it email you (or not) whenever it finds something. 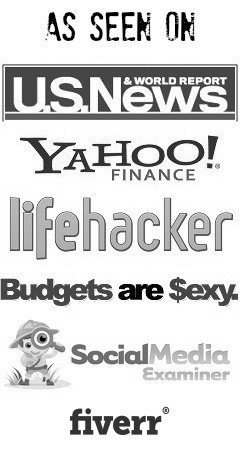 The value is in the list it creates and how quickly you can fix the links. I ran it on Scotch Addict and it found 18 broken links out of 495 – not bad. From this screen, you can edit the link, unlink it, or mark it not broken. You can address each one in seconds. No need to load up the page, hit Edit, and find the link. This baby does it all for you. I’ll list a great alternative below but this is really the solution you need. Xenu Link Sleuth is an application you can download to your computer. You give it your site and it’ll crawl the entire site, searching for broken links. It’s very fast and extremely effective. The advantages of this tool over a plugin is that it won’t impact your site’s performance. 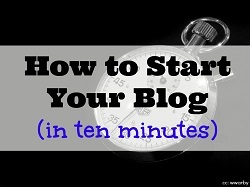 Every plugin you install will have an impact on load time. The downside is that you can’t edit the link inside the application, you have to load the page, then edit it, find the link, then save. That’s just too much work. While Xenu isn’t great for finding broken links on your site, it’s great for finding broken links on other sites. Links that should be fixed and perhaps linking back to you! If you’re concerned about performance, install and activate the plugin. Use it to fix your problems, then delete it. Install it the next time you want to check. Don’t be the reason someone throws their coffee soaked computer out the window! Yep, I use (and love) this plugin on an ongoing basis. There are times when the links it finds aren’t actually broken — presumably b/c the site you’re linking was temporarily loading slowly (or not at all) when the plugin went to check, but this is still a really handy plugin to have. I’ve also heard that having broken links on your site could have a negative SEO impact. This is almost surely true for broken internal links because it’s an indicator (negative) of quality and it also disrupts crawlability. As for outbound links, I’m less sure. But it’s easy enough to fix, so why not? “Don’t be the reason someone throws their coffee soaked computer out the window!” Lol, no doubt! 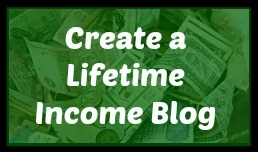 I love this plugin as well and is so easy to use. I go over them once a week to check up on them and generally only takes me a few minutes of my time. There are too many benefits not to do it. Broken links are no good. I went through my site two years ago and fixed all old pages. I was sad by the amount of broken links on there. Almost as bad as a broken heart! I’ve used the Broken link checker before, and liked it, but ended up having issues with it slowing down my site. For that reason I used the other program, Xenu Link Sleuth, to find broken links and that worked without any major issues. Any broken links it found I was able to find and fix/remove quickly later on. I wouldn’t think the plugin would have an effect unless it’s actively scanning. So maybe you had it set to check too frequently? As for Xenu, it’s Windows only, so that’s a non-starter for me. 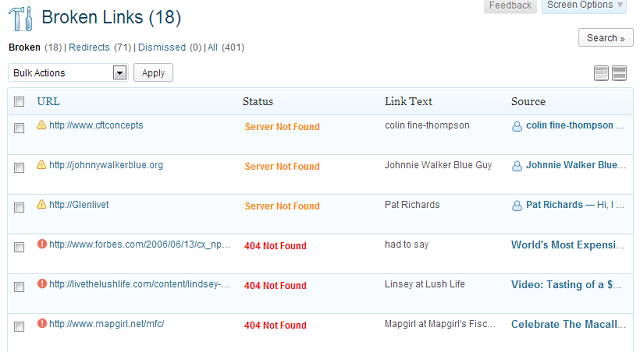 Another important aspect of the Broken Link Checker plugin is that it gives you all of your redirects as well. A broken link is easy enough — they lead nowhere — but you might find you have a bunch of redirects that work but point to bad sites (like a personal finance site that’s now a massage site — true link I found) or landing pages where the domain expired. I think in many cases it’s worse having a bad redirect than it is having a broken link. I used broken link checker in the past and its great. Unfortunately my new hosting company doesn’t allow it. They recommend using http://www.brokenlinkcheck.com/ to find all the broken links. Then you have to go and repair them all yourself. I think I’d rather use Xenu than some third party site. FYI while I like this plugin, a few places do not allow this plugin (WP Engine comes to mind). It’s a resource hog and a few of their tables are not properly indexed, and some poorly developed SQL queries. Sounds like a run sporadically and then delete to me. I always recommend that my clients keep Broken Link Checker deactivated and activate it once a week for about 30 minutes, then deal with any broken links and deactivate again.. It pulls on the database way too hard to be active all the time, but it’s still the most convenient tool out there. There really aren’t any better alternatives huh? Great post, Jim. I’ve had “fix broken links” on my to do list for quite some time, then moved it over to my assistant’s list. Anything to make her job easier means she can move on the next (hopefully revenue generating) task! One question though. I get nervous about plugins…is there any risk to using it other than the resource load? As in any problems with security or corrupting WordPress databases/files? Not that I’m aware of, but you should be doing backups anyway. Ha ha yes we have backups of backups in different parts of the country. Nice, I was actually wondering how people found broken links without having to do it manually. I just added this plugin to the site and went through the process of fixing 15 broken links – thanks for passing this along Jim! I’ve had this plugin for months but hadn’t actually ran it. Your post reminded me too and I found 9 broken links! All fixed now, so hopefully I won’t ruin anyone’s day. You saved a life today!